Flexibility is often extolled as a virtue in teaching. It is also one of the 5 ‘F’s for managing children positively: friendly, firm, fair, flexible and fun. My memories of times I’ve been flexible in my teaching are also memories of some of what I like to think of as my most successful lessons. Two examples are about snowmen and silkworms! In the case of snowmen, I had arrived at school one freezing winter morning and started the opening lesson routine with my 5-year-olds as usual. About ten minutes later, it started to snow (not very usual in Madrid) – huge, white snowflakes slowly and magically falling before our eyes outside the classroom window. The children were excited and enchanted – for many it was the first time they had ever seen snow – so I abandoned my original plan (there was nothing else possible) and we spent the rest of the lesson talking about snow, learning a snowman song, drawing a snowman, making it into a pencil puppet and doing a very simple snowman role play. The children loved the activities and participated with huge enthusiasm, largely I think due to the immediate ‘here and now’ relevance of everything we did. In the case of silkworms, my class of 8-year-olds were coming to the end of a class project on bugs*, a topic which I find usually fascinates this age group. One child turned up to class proudly clutching a shoe box with holes in the lid. 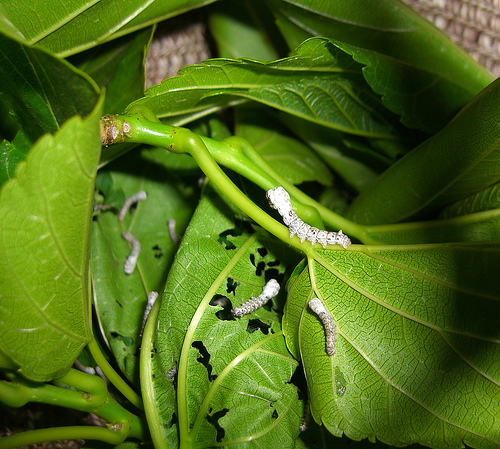 When the lid was taken off, the box was full of tiny silkworms, wriggling away under a bed of mulberry leaves. The class was thrilled and delighted, and everyone crowded round closely to look. Again I decided the only thing to do was to ‘go with the flow’ and abandon my original plan. So we spent the lesson talking about silkworms, learning what they eat, observing and counting the silkworms in the shoebox, drawing and labelling a picture of the silkworms and mulberry leaves, and writing a short description which we built up together on the board. The children’s enthusiastic response was again testimony to the value of flexibility. choose topics e.g. by finding out about children’s interests and incorporating these. organise children e.g. according to friendship, ability, gender, random. set up activities e.g. depending on whether we want the children to stand up and move around, or to remain seated. repeat activities e.g. if children enjoy a particular game or song and want to do it again. time activities e.g. if children find activities easier or more difficult than we anticipate. ask and answer questions e.g. the kinds of questions we use e.g. open or closed, and who asks and answers the questions (i.e. not always us). check answers e.g. in pairs, orally with the whole class, circulating an answer sheet. give feedback e.g. oral, written, to the whole class or individuals, by us or by peers. offer choices e.g. in what children do, in the order they do it, in how they do it (e.g.by hand or on computer), in homework tasks. use L1 e.g. to avoid misunderstanding, to explain a new concept, to resolve conflict. use reward systems (if we do at all) e.g. stars, points, raffle tickets, stickers. It would be great to hear your experiences of flexibility in your teaching and any other ideas you have to add to the list. Please do share! * See p. 237 in 500 Activities for the Primary Classroom for details of the kinds of things we did as part of the project. Photo credits: Snowmen by James Matthews; Silkworms by Mary Mactavish. Nice to meet you through your blogs. I enjoyed reading your blog on Flexibility. From my experience, I feel that we have a larger scope of organizing creative activities in Outdoors. I mean outside the classroom. Children love to move out of the closed walls. They want space, a space to move free, to think free, and act free. I usually take the children outdoors, in the sunshine. I give them freedom to think and do a role play from their day to day experience, or a role-play based on their lessons. They enjoy it. I have even fixed the last day of the week to perform these activities. Thank you so much for making this excellent point. You’re so right! If we can be flexible about where we hold our lessons and can take the children to a space outside where they can move around and enjoy sunshine, then that can be a wonderfully invigorating change. It’s great to hear that you are able to do this on a weekly basis and that children do role plays based on their everyday experience or what you have done in lessons during this time. I can imagine the children really look forward to this day! Do the children do the role plays in pairs or groups or do they perform them to the whole class? And do they prepare the role plays outside too? It would be fascinating to hear more. In my recent experience, I’ve been able to take children to the gym or playground if we need more space to do activities but only occasionally and without the flexibility you mention which sounds great – so thank you so much for adding this ingredient to the list! First of all congratulations on the blog! There was definitely a need for more comment on primary teaching out there, and this really does an excellent job. I saw the photo of the snowmen and thought for a minute you were going to say you took the kids outside and got them to make them! The ‘here and now’ relevance you mention is so important though – something which coursebooks that so many teachers (in some cases are obliged to) follow can never really provide. When I was teaching, I found that it really took time to become confident enough to respond to situations like those you describe. I suppose it’s all part of a teacher building up their repertoire or toolkit of approaches and activities. Later on I felt confident enough to be flexible by offering choices, but within a fairly consistent framework. For example, the ‘end of the lesson slot’ (why do people call them coolers?) could be a song, or a puzzle, or word tennis etc – and they could choose which one. So, flexibility in a familiar framework – three Fs! Many thanks for your positive comments about starting a blog on primary teaching – that’s kind of you to say and very encouraging to know. Yes, I wondered whether I might inadvertently be giving a wrong initial impression that we all went outside to make snowmen! 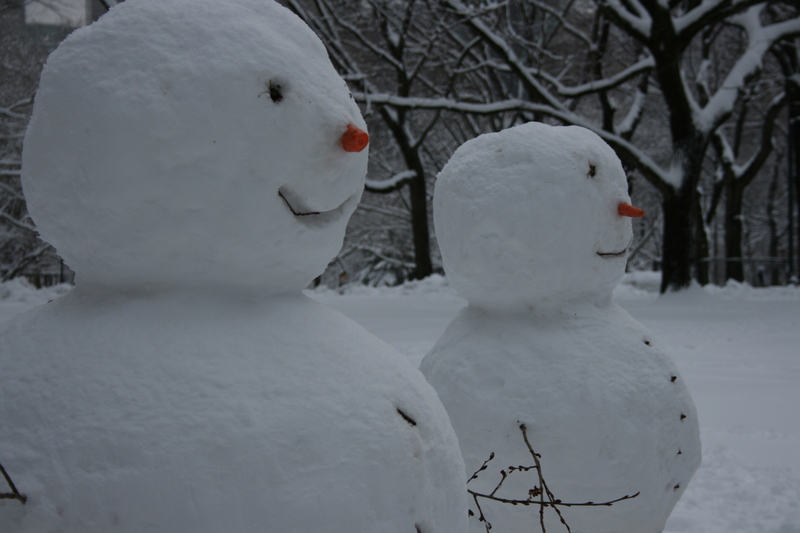 But I couldn’t resist using the photo of these wonderfully traditional snowmen to illustrate the theme! Luckily, during my lesson the snow hadn’t settled, as goodness knows how I would’ve managed to get 25 5-year-olds playing in the snow for the first time to learn any English at all, never mind the health and safety aspect which is also always paramount with little ones! Thank you so much also for raising the very important point about confidence here. I agree with you completely that as teachers we need to feel confident and secure in ourselves in order to be able to depart from lesson plans and respond to situations ‘spontaneously’. This inevitably grows over time and with experience, and as we develop an ever-expanding ‘repertoire or toolkit of approaches and activities’ as you say – a great way of putting it. I also completely agree with you about offering flexibility within a consistent framework – and that this the most usual way that we can be flexible on an everyday basis. In fact I think it’s the existence of a robust framework and clear parameters for the shape of the lesson that allows us to be flexible and introduce variety in the way you describe but without losing coherence. So very definite agreement with your 3 ‘F’s here! And thanks very much for suggesting them. The role play is done in groups, and it is done to the whole class. A group consists of six to seven students. They are free to choose a theme of their own, or any plot from the lesson. They are also encouraged to write the dialogues, and rehearse before the final act. The activity helps to develop both their language and life skills. Many thanks for explaining how the role play is done. It sounds very motivating that the children are free to choose a theme of their own. I can also imagine that the fact that they write and rehearse the dialogues before performing to the class is very good for boosting their confidence and self-esteem. It’s great to be able to work in this way and develop both ‘language and life skills’ as you say. For many older YLs, there is nothing worse than following the same teaching menu day after day but it does still happen. To avoid this, in Holland when time-tabling permitted, we sometimes swapped classes for 10 minutes or if there was enough room, got all the children together and did some peer teaching. Back in the classroom, I encourage learners to come and ‘be teacher’ for 3 minutes (yes, I have an egg timer for these occasions!) as many love to role play this part. As Carol says, as long as there are parameters and as long as we don’t upset any child who may be vulnerable. There are, after all, many YLs who need the security of the teaching menu. Thank you very much for raising the issue of flexibility from the point of view of the learners. You’re so right that there can be nothing duller than following exactly the same ‘teaching menu’ every day, especially for older primary children, and it’s a great way to engage them if there’s a surprise factor. I love the sound of the ideas you used in Holland to create variety, such as swapping classes for short periods or peer teaching with classes together – great when the school and timetable are flexible enough to make this possible. Thank you so much also for sharing the lovely idea of getting learners to ‘be teachers’ for 3 minutes with your egg timer! More extrovert and self-confident children love this role and, in my experience, the way children naturally tend to imitate aspects of your teaching style can also be amusing and provide you with some quite revealing feedback too! The other important thing here also is the learning value of the activity of teaching others – I seem to remember (although don’t have a reference) that it was Einstein who said that it’s through explaining something to someone that you understand it better yourself. I also completely agree with your last point that the bottom line in all our attempts to be flexible is safeguarding the children’s feelings of security, especially the most vulnerable.